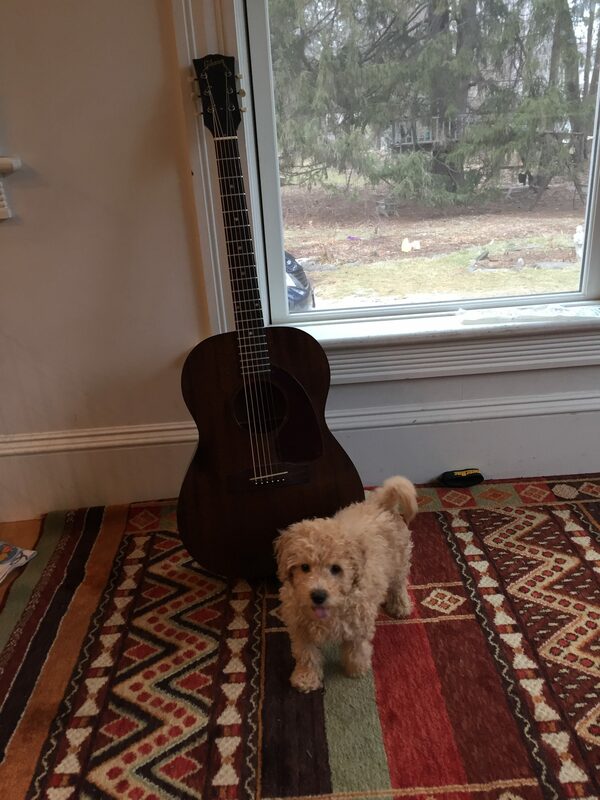 Puppies and guitars–that’s my solution. Yesterday, I met my husband and our friend Tony on the corner of Crafts and Main. It was 2pm, and I had Hudson in my arms. He’s a little celebrity, inviting ear scratches and admirers wherever he goes. An African American meter officer stopped to admire him. “He’s like a sweet fur blanket!” she exclaimed. We introduced herself. Her name wasDonna. “He’s my anti-Trump medication,” I told Donna, stroking his ears. An older white guy who had just come out of Glazed, our donut shop, stopped and stared at us. “That’s a terrible thing to say about that poor dog! I can’t wait till tomorrow! Go Trump!” And he turned to cross the street to his parked car, near City Hall. “I know more about history than you do,” he huffed, opening his car door. A woman sat cowering in the passenger seat, gray hair, gray face, gray lips in a tight line. But Tom and Tony and Donna were shouting too. “Come back here, Nerissa!” they said, and so I crossed back over, hearing his car pull out and screech away behind me. Donna shook her head at me. “Honey. I love you. I don’t want you to get hurt. There are a lot of people out there right now whose passions are huge. Be careful, girl.” I looked into her kind face. And as angry and shaken as I was, I did not fail to take in the glory of this moment. The white guy ran from the police, an African American woman, who protected me not with guns or the law, but with a kind words. I fell into her arms and she hugged me, then laughed. “Take care of that puppy, now,” she said going back to her job (her other job–metering. She was totally doing her job by hugging me). Donna laughed and walked down the street. Tom scolded me for endangering myself and our dog. “It’s good you aren’t marching with us Saturday, you’d get us all killed,” he said. As I mentioned in my last post, I have been reading autobiographies of musicians. I finished Bob Dylan’s Chronicles in December, and next up is Keith Richards’ Life, which inspired me to buy my friend Jay Pasternak’s 1964 Gibson guitar (mahogany beauty, my first acoustic Gibson; anti-Trump strategy #2 is to learn Keef’s five-string G-tuning). Today I finished Bruce Springsteen’s Born To Run. I am so glad I read this big fat 500+ page book. I have always loved The Boss, and now I know why. What a huge heart the guy has, and what a thoughtful person. And even though he is a multi-platinum millionaire legend, and I am a folk artist whose fan base was about 20,000 at my prime, I completely relate to much of what he writes about. The writer contracts, at the beginning of this kind of memoir, to reveal to the reader his mind. This he says, at the end of the book, he has done. And what I see is an incredibly hard-working artist, who is fully aware of his limitations–a less than pristine voice, for instance–and who when he compares himself to his heroes, Elvis, the Beatles, the Stones, Dylan, he comes up short. But, he says, he knew he had to work for it. And so he did–he eschewed drugs and much of the stereotypical rock and roll lifestyle for the sake of the Holy Grail–his music. His dedication to music borders on religious fervor, and it’s contagious and inspiring to read about him. When I was in my 20s, I wanted to write political songs, but I couldn’t do it. Bruce taught me how. I think he’s actually the best male political songwriter of his generation. The reading was gratifying. My poems are meant to be read. Like songs, they don’t really live on the page. I was blown away by the writing and presence of the other women I’d invited to read with me; Sarah Buttenwieser read a piece on listening to your children during this strange and fearful time. Naomi Shulman wrote “No Time to be Nice,” a reflection on the so-called “good Nazis” in 1930s Germany. Sarah Sullivan wrote a poem about wanting to hide from the news, and Miliann Kang exhorted us all to stay present, fight for our democracy and trust that struggle will make us stronger. Lisa Papademetriou MC’d the event and contributed her beautiful Click Workspace for the event. We raised over $300 for the Women’s Fund of Western MA on an icy January night, and I got to sing my new song. I promise not to chase down any more Trump voters, though I do crave real conversations with them. This is the whole problem–we walk away from each other, and we are afraid of each other. I pray that tomorrow the marches are peaceful, that all are safe, and that we listen to each other. Though I don’t know exactly what I am going to do next, I do know I am in the right line of work. In fact, I have rarely felt so well-placed. For now anyway, providing space for folks to feel seems like our main job. 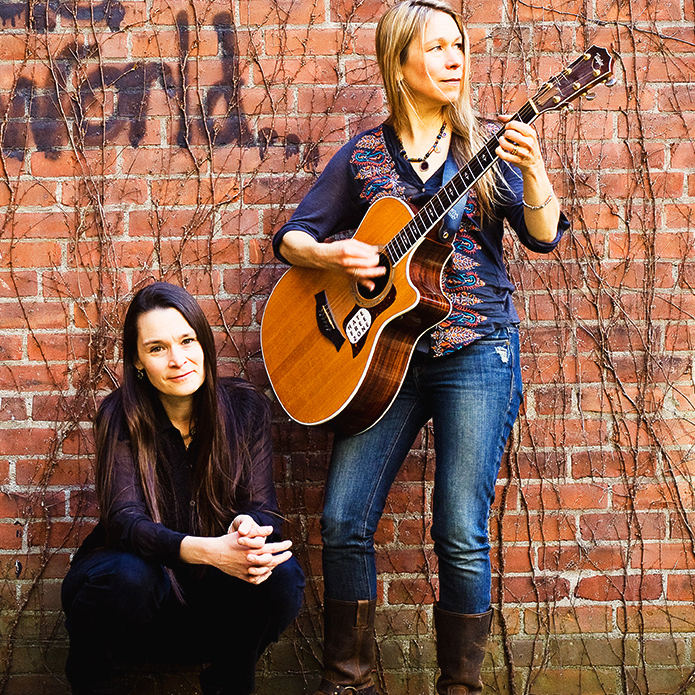 To that end, Katryna and I are doing a show Saturday night at a venue in Granby CT (near Hartford, near Bradley Airport) for those who marched in Boston and just want some more, or for those who couldn’t march and just need some Spirit. There are more of us than there are of them. Don’t forget it.